One of the joys of camping is sitting down to a hearty meal after a long day of outdoor activity. 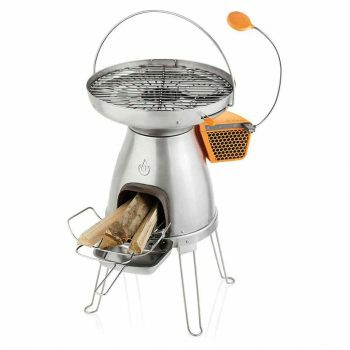 If fueling up on granola bars and beef jerky alone isn’t going to cut it for you or the people you’re with, take a look at our list of some of the best campfire cooking equipment. While cooking over an open fire is perfectly fine for preparing meals in the outdoors, you can step up your outdoor cooking a notch with outdoor stoves, and even pots and pans that utilize propane or wood for fuel. This makes it a lot easier to prepare meals in areas where you either don’t have the time or the regulations in an area prohibit the use of open campfires. Even if you prefer the taste of fire cooked meals when you’re outside, one of the major benefits of using a camping stove and pot is the speed at which you can boil water for coffee or tea. Boiled water is particularly essential for freeze dried meal preparation. Depending on your needs, there are plenty of great options on the market for camping cookware. We’ve compiled a list of great campfire cooking tools to help you choose the equipment that fits your needs. Here are some things to keep in mind when you are shopping for a cookware system for outdoor use. The first thing to consider when shopping for camping cookware is how you’re going to use it. Backpackers will require a much more lightweight cooking set made of different (often more expensive) materials than someone who will have access to a vehicle for transporting the gear to a campsite and doesn’t have to worry about the equipment being too cumbersome to carry in a backpack. Another thing for customers to consider is how efficient the camping cookware is. This goes for both stoves and the cookware itself. Getting the most heat out of a propane tank possible is important for fuel efficiency, especially on multi day trips when running out of fuel to boil water could lead to inedible freeze dried meals. Some materials are better than others for heat retention and spreading the heat evenly throughout the entire pot or pan. Another concern is how scratch resistant and durable a certain pot or pan might be. Camping cookware is subject to a lot of rough treatment in the outdoors, so dents and scratches are a definite possibility. The size of the kit is important when considering how many people you’ll be cooking for. For a group camp for a family or scout troop, a heavier and larger set might be required to cook for that many people; more than one burner and larger pots and pans can cook a higher volume of food. Another consideration is what kind of fuel the stove uses; here, we have included several that use propane and another that is fueled by wood. Wind shields are also a great feature for stoves as even a mild breeze can disrupt the cooking flame and make it more difficult to cook. For some models of stoves, you can buy a whole variety of attachments for different functions while preparing meals. This includes attachable extra burners or apparatuses for connecting frying pans to stoves that are normally built for pots. The amount of heat put out by a stove can help you judge how quickly you’ll be able to cook a given volume of food or water. This is measured in BTUs, or British Thermal Units. One BTU is equal to the amount of energy (measured in joules) needed to raise the temperature of one pound of water by one degree Fahrenheit. So the higher number of BTUs a stove puts out means it is putting out more energy for boiling water or cooking food. Material for cookware is important for heat dispersion and weight of a pot or pan. Hard anodized aluminum is lightweight and generally disperses heat evenly. Because of its even heat dispersion, you can save on fuel which is a major benefit for backpackers. It’s a good idea to use wood or plastic cooking utensils to avoid damaging your pot or pan. Titanium is the lightest cookware you can find, and it’s best for boiling water quickly for freeze dried meals. Stainless steel is not as light as anodized aluminum or titanium, but it is durable and affordable. Depending on how you plan to use the cookware and how many people you’re planning to cook for, you can use our list to help find the camping cooking equipment that will work for you. The following are some of the top rated campfire cooking equipment that money can buy. It’s highly recommended that you check them out. The Camp Chef Everest Stove is a great option to take on camping trips with a group or when you plan to cook food that might require more than one burner, such as pasta and a sauce or other ingredients. The two burners use propane and emit 20,000 BTU of heat each, which can be very powerful so make sure to take care not to burn food because this stove puts out so much heat. However, the burners operate off of separate controls so it is easy to keep one at a lower temperature than the other and cook food at different rates. The cooking grate on this stove is nickel coated, and the stove uses a matchless ignition system. The matchless ignition feature is great because it eliminates worries about wet matches or faulty lighters, but it’s still important to bring along matches in case something goes wrong with the ignition feature just as a common sense precaution. Related: Customers who buy this Camp Chef Burner also frequently buy the Camp Chef Tank Hose Adapter and the Camp Chef Carry Bag. The hose adapter is of great quality and will attach to a good number of bulk tanks. It does not require any assembly and has heavy duty fittings for great connection. JetBoil is one of the most prominent brands in the outdoor cooking industry, primarily known for their smaller systems that rapidly boil water. 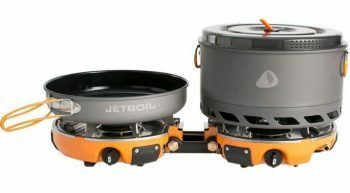 The Jetboil Genesis Cooking System takes it a step further, and provides two burners for cooking food using a pot and pan. Each burner puts out 10,000 BTU of heat and can boil one liter of water in 3 minutes and 15 seconds. The Genesis is compatible with a 16.4 ounce propane bottle, which can boil 48 liters of water over the course of its life. The 5 liter pot that comes with the system is substantial enough to hold enough food to feed several people. The components of the Genesis system nest inside one another and the handles on the pot and frying pan fold in for portability. The frying pan is made of ceramic and is non stick. The Genesis also features an attachable windscreen to improve cooking conditions in adverse weather conditions. Another great feature of this cooking system is its fuel output port for connecting other JetLink compatible stoves or side burners. Its efficient design makes it a great choice to carry with when your needs are a lightweight, reliable cooking system with multiple burners. Related: Customers who buy the Genesis burner also buy the Jetboil Luna Satellite Burner and the Jetboil Propane Tank Hose. The satellite burner comes in a stable low profile design and also has a push button igniter. It is best for boiling water for fast food. The hose is 5 foot long and an easy and fast connect feature. All the three equipment combined will definitely ensure you have a great outdoor time while cooking your meals. The BioLite Base Camp Stove is unique from the others reviewed here because it incorporates a battery into its design for use other than cooking. It uses wood and small branches as fuel to burn and convert into electrical energy for charging devices through its USB output. It includes a powerpack with a 2200 mAh lithium ion battery which powers a 5 Volt USB output, so no external fossil fuel tanks are needed. In addition to the battery, the stove includes a LED monitor that displays information about the battery level and power generated by burning wood. A USB light is included to help illuminate the stove surface during nighttime cooking. The BioLite stove also has a level to help convert heat for grilling over the large grill surface into power for boiling water. The grill surface is ideal for cooking for groups of people, as it is 138 square inches and can fit 8 burger patties. To get the most out of this stove, use the driest wood you can find to generate the maximum amount of heat for the best efficiency. The better quality wood you use, the more power the stove will generate. The great thing about this stove is that you get the flavor of cooking over a fire without too much smoke to deal with. It’s a unique option for grilling at base camp. The casting does not fit the filter snap in plastic piece properly. Related: A frequent item that is often bought with the burner is the Base Camp Carry Pack.It is easy to carry around as it has a 2 way adjustable strap. It also comes with a smart LED dashboard which monitors the generation of your power and the battery level. Even more interesting is the fact that it has a flexible USB pass through light that enables you to light your meals as well as charge your devices at one go. 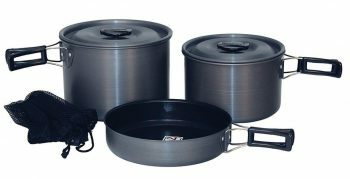 The Texsport Black Ice Cook Set is different from the other items reviewed thus far because it does not include the actual heating apparatus or stove. This is simply a cookware set that comes with a mesh bag for storage and carrying. The pieces of this cook set nest inside one another, and if your stove is small enough it can fit inside and complete the nest. 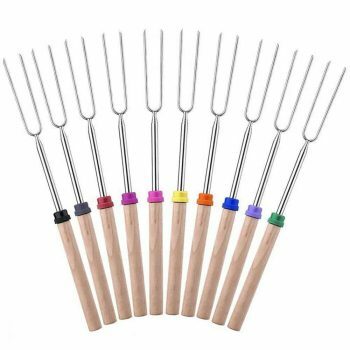 It is made of anodized non stick aluminum for easy cleaning, and the handle is insulated to help prevent you from burning your hand when you grasp it. It includes one 7 inch frying pan and two pots, one of which is a 1 quart pot and the other is a 1.5 quart pot. The insulated handles also fold in to help with portability and nesting. The fry pan has high sides so it functions a little differently than a skillet, but you don’t have to worry about food falling off of the sides onto the ground. It’s lightweight enough for overnight trips but not lightweight enough for a long term thru hike. Related: Customers who bought this amazing cooking set also bought the Coleman Classic Propane Stove and Coghlan’s 2 Burner Non Stick Griddle. The camp griddle has been coated with heavy gauge aluminum griddle with non stick surface so that you have it easy when cleaning. It has a hook to it allowing you to hang it after washing as you wait for it to dry up. The propane stove has wind block panels to protect burners from wind. It has perfect heat technology for more efficient cooking with less fuel. The Camp Chef Redwood Portable Fire Pit is definitely not made for backcountry excursions, but it is useful for backyard cooking because the fire and fuel are contained for easy cleanup. You can cook on your patio or sidewalk and not worry about leaving marks on the lawn because of a fire. This fire pit is propane fueled and includes a 5 foot long hose that connects to a propane tank and fuels the “lava rocks”. It’s also unique from a backyard fire because it does not require matches to start; instead it has a matchless ignition feature and a dial to help control the flame. The fire pit is made of heavy gauge steel and can put out 55,000 BTU of heat per hour. It also includes a zippered travel bag so you can take it places without worrying about a mess in the car. It’s a convenient device to have for backyard use or camping trips. Related: To fully enjoy using this cooking equipment, customers often buy the Mr. Heater Propane Hose. This product is a propane hose assembly with hand tightened swivel on both ends. It can connect between 5 – 20 pounds propane tanks to disposable propane cylinder appliances. This Homitt Marshmallow Sticks comes in 10 colors, and they collapse down in a telescoping skewer for easy portability. Each roasting stick has two prongs, so spinning and food falling off isn’t as much of an issue as it can be on single pronged sticks. While they’re collapsible, the roasting sticks are also sturdy and durable and are great for kids to use, although it’s important to use common sense because they are sharp enough to hurt if poked and the steel gets really hot when you’re using it to cook in a fire. These sticks are a nice addition to your cookout or campsite. The roasting sticks also come with a pouch for storage. Related: It is always great to have things covered up. That is why when buying these BBQ sticks, customers also frequently buy the Terrazzo Fire Pit Cover. It is round to ensure it properly covers all that should be covered. 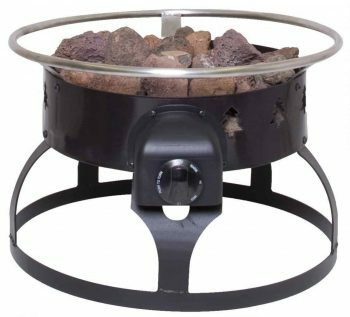 The cover fits round fire pits of up to 44 inches in terms of diameter It has dual vents that help t reduce condensation inside. This cook set is unique because it includes plastic serving components while most other cook sets only include the pots and pans needed to cook with. The Stansport Cook Set includes a 9 inch frying pan, a 5.5 quart cooking pot, a 1.5 quart stew pot, a 6 cup coffee pot with a lid, four plates, four plastic cups, a frying pan handle, and plastic salt and pepper shakers. As an aluminum set, it’s lightweight enough to not be cumbersome on trips but works well for group camping trips since it includes so many components. A titanium cooking set would be more lightweight for trips where that matters, but this set includes a lot for its value. The coffee pot also includes a pour spout on the rim and the cups have volume markings on them so they can double as measuring cups. This set is larger than a lot of other comparable cooking sets, which can be a pro or con depending on how you’re planning on using it. Overall, it’s a good option for light use and a great price. Related: To match this amazing aluminum cooking set, customers also often buy it together with the Coleman Classic Propane Stove. It has 2 independently adjustable burners which give you just the exact for 2 temperature zones. It has a wind block panel that protects the burners from wind and adjusts for different pan sizes. If you’re setting out on a backcountry trip but can’t do without your tea or coffee during the trip, GSI Outdoors Halulite Tea Kettle is a great option to include in your cookware set. Halulite, made by GSI Outdoors, is an ultralight aluminum alloy that is resistant to burn circles and scratches. It also disperses heat well for excellent efficiency when heating boiling water. With a volume of 32 ounces, the tea kettle is large enough to store many backpacking stoves inside of it to improve packing efficiency. The handle is coated for insulation and the pot itself is seamless which helps reduce incidence of leaks. The excellent heat conduction is important because it helps with fuel efficiency so you don’t waste propane on heat lost to the environment while boiling water. Like other GSI Outdoors products, this kettle is subject to manufacturer’s warranty against defects. For a tea kettle, the GSI Outdoors product embodies lightweight qualities and fuel efficiency, which are the game changers for backpacking equipment. Related: To enjoy your time during your outdoor activities, it would be great if you also buy the GSI Outdoors Halulite Pot and the GSI Pivot Tongs. The 3.2 liter pot has dual locking with stainless steel handles for better handling. The aluminum lid has straining holes making straining water easy and simple. The silicone thumb pads protect hands from heat. Any outdoor cooking activity will always call for using tongs. There is a wide variety of camping cooking equipment on the market for a large price margin. Backpacking, car camping and backyard cooking all correspond to different gear to give you the best experience for what you want to pay and the weight you are willing to carry with you. Understanding the specific features to look for when you’re shopping for camping cookware is a major advantage that can help you pick out what you need. So what type of equipment do you absolutely have to have for camping?